"More than 145 million Americans were affected by the Equifax hack last summer. The personal information accessed included Social Security numbers, driver’s license numbers, and credit card numbers." Question: How can sensitive data such as Social Security numbers and credit card numbers be accessed at such a massive scale without raising alerts to Equifax security team? Next Question: If sensitive data such as Social Security numbers and and credit card numbers were accessed in an unusual way in your organization, do you have monitoring in place to generate alerts? Unfortunately, for most organizations, the answer is no. With the growing number, variety, and locations of data stores, most organizations do not have a firm grip on where their sensitive data is located, let alone monitor those sensitive data locations for suspicious access. In this post, we describe how to build a system to continuously monitor for suspicious sensitive data access. The first step is knowing where your sensitive data are located. Everything follows from that. We need an audit trail of data access capturing what data was accessed, when, by whom, from what client location, and using what API call. It analyzes audit events to learn normal access patterns in order to detect unusual access patterns. Next, let’s zoom into each of three components. "FedEx was storing more than 100,000 scanned documents including passports, drivers licenses, and security IDs on an unsecured Amazon S3 server. This Amazon S3 server was forgotten in an years-old acquisition." Do you know if you are storing sensitive data in S3? With the growing adoption of cloud and big data, a typical organization has far too many data stores to manually examine and compile a list of sensitive data locations. Clearly, sensitive data discovery needs to be automated. The Kogni Discovery Engine is the ideal solution for this problem. It scans an enterprise’s data stores and automatically builds a Sensitive Data Catalog. 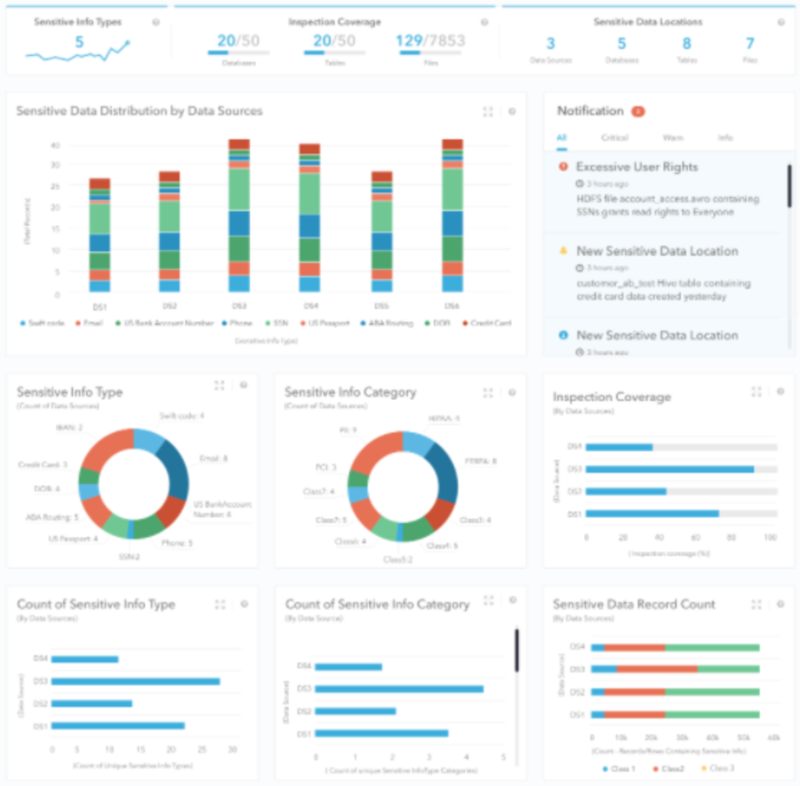 The Sensitive Data Catalog can be explored in Kogni’s intuitive, interactive dashboard, and it can also be accessed through an API to build higher-level functionality such as monitoring for suspicious sensitive data access. An audit log records events containing information about who accessed what, when, from where, etc. Audit events from various audit logs are typically streamed into Kafka. The Anomaly Detection Engine reads directly from Kafka, and is decoupled from raw audit logs. Good news: Almost all data stores (Oracle, MySQL, S3, Hadoop, etc.) support audit logs. Bad news: Each audit log has its own custom format. 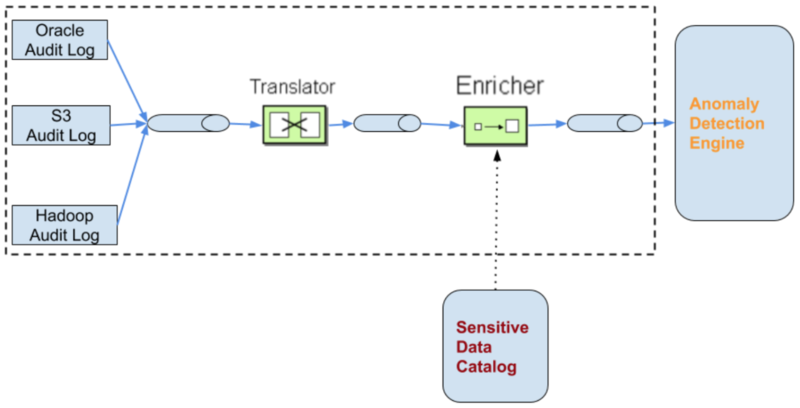 What’s needed is a Message Translator that translates these custom audit-event formats into a Canonical Data Model which our downstream Anomaly Detection Engine understands. Additionally, audit logs only tell us what tables or files were accessed. By themselves, audit logs do not tell us what sensitive data, if any, was accessed. This is where the Sensitive Data Catalog is leveraged. Kogni has a Content Enricher that queries the Sensitive Data Catalog with the name of the table/file in the audit event, and enriches the message with the information about what, if any, sensitive data was accessed. This audit event stream is fed into an Anomaly Detection Engine to detect and alert on anomalies. But given the high number of users and multitude of sensitive information types, it is infeasible to check for anomalies visually and manually. The anomaly detection process needs to be automated. We need an anomaly detection model that can automatically learn what is normal, and alert on abnormal/unusual/suspcicious behavior. Seasonality: The model needs to learn that what is normal level of activity on a weekday might be abnormal for a weekend. Trend: Long-term time-series data often has trend. Without accounting for trend, the model will generate many false-positives. Extreme Values: The model needs to be robust to extreme values present in real-world data. Personalization: The model needs to learn the unique access patterns of different users. A customer service rep with a weekend shift will have a high level of activity on weekends. The model needs to learn each user's unique access patterns in order to avoid false positives. Adapt to Change: Company policies change with time. Employees get promoted, change departments. User behavior changes with time. Therefore, the model needs to adapt to changing user behavior to reduce the false-positive rate. One will need to define too many rules to handle the above objectives. Worse, these rules will need to be modified frequently to adapt to future changes. Therefore, we decided to build machine-learning based anomaly detection models so that the models can self-learn from historical data and adapt to future changes. This paper is based on work done at Yahoo to detect unusual/anomalous time-series. This excellent blog post is from Netflix. They detect anomalies using Robust Principal Component Analysis (RPCA). This paper is based on work done at Twitter to automatically detect long-term anomalies in the presence of trend and seasonality. We discussed why it is imperative to monitor sensitive data activity and described the concrete steps required to build such a monitoring system. We also discussed the need for Automated Sensitive Data Catalog and how it can be leveraged for detecting suspicious access of sensitive data.